Jason and Nadine Davies are the owners of The Architectural Forum Ltd, which was established in 1988 and has since strived to offer the best architectural salvage at a very competitive price. We are proud to offer honest, friendly advice and assistance, whatever you may be looking for. At The Architectural Forum, we are very conscious of the importance of reclaiming and salvaging, and the positive impact on our global resources and environment. 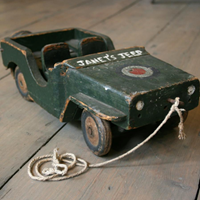 We believe it is imperative to reclaim, refurbish and re-use as much as possible, as this puts less pressure on resources and stops the items simply going to landfill. With our emphasis on refurbishing and restoring, we are proud to be preserving the valuable skills of yesteryear, and giving antique items a second life and a chance to be appreciated by future generations. On the surface, the process of salvaging parts from an old building can seem relatively straightforward, but it is often a very challenging and pressured task, full of complications! Once onsite, Jason and the team often have very little time to recognise and remove the key pieces that are of salvageable and saleable condition. Sometimes, as beautiful and historically interesting as they may be, pieces cannot be saved as they would take far too long to restore, or take too much room in storage. 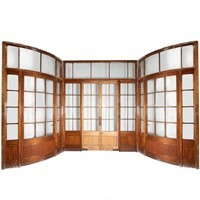 Once the salvage is removed, they are taken to one of our premises for restoration. Restoration and refurbishment of all iron items, including cast iron fireplace inserts, fixtures and fittings, and cast iron radiators, is done at our Southgate Road workshop. Reclaimed stonework is repaired by Architectural Forum's in-house mason. Wooden items are repaired and re-polished, and some may be repurposed or re-crafted into a new item. Old, redundant, Victorian window frames, for example, are up-cycled into charming, large mirrors by glazing them with new mirror glass. Architectural Forum also has a network of specialist craftspeople who can assist in the restoration of other items, for instance, replacing broken globe lanterns in early Victorian street lamps. We have been involved in some pretty spectacular salvage jobs, including removals from the British Museum, Tate Britain, the Tower of London and several prestigious London houses. Jason, along with Ted, from our sister company V&V Reclamation, took part in the salvaging of architectural pieces from the Baltic Exchange which is now home to the Gherkin. This turned out to be the largest salvage of any building in Europe since the original London Bridge was sold to Arizona in 1967! 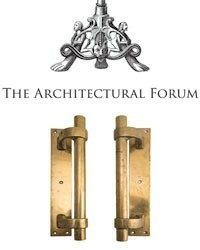 THE ARCHITECTURAL FORUM to provide own terms and conditions. Consumer Contracts Regulations apply. It is the individual Dealers responsibility to make themselves aware of what the Distance Selling Regulation rules contain; these regulations are open to change, may vary and are detailed, so you may wish to familiiarise yourself with such via the many websites available to you on this subject. You have the right to return items purchased via the internet up to 14 days following receipt of the item to the specified delivery address. If you collect an item in person or arrange your own delivery, then this term starts immediately you or your carrier collects the item (this is to avoid your own carrier sitting on the item for a long time before delivering it). Always ask for an invoice from the Seller. On the invoice you should have the date of the item, any provenance, full description, including any restoration or damage. It should state terms of payment and delivery and returns. It should also show the business name, business address, contact numbers, email address and VAT number if applicable. There are no recently sold items from this dealer.